The origins of the Betsson Group stems from 55 years ago when the company AB Restaurang Roulette started offering Roulette gambling in restaurants and bars back in 1963. The mother company was also a large shareholder of Netent in the late 1990s and early 2000s before Netent was split off into its own entity. 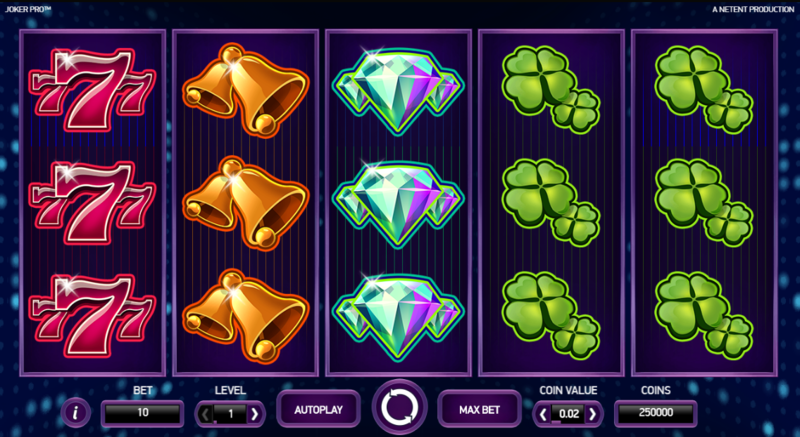 During the 2000s and early 2010s, Betsson quickly became large in the Online gaming industry and made acquisitions of other known brands in the Scandic region such as Betsafe.com and Nordicbet.com. Betsson.com is still their flagship brand, and it shows that they spend a lot of money marketing it. At Betsson you can feel completely safe when gambling. 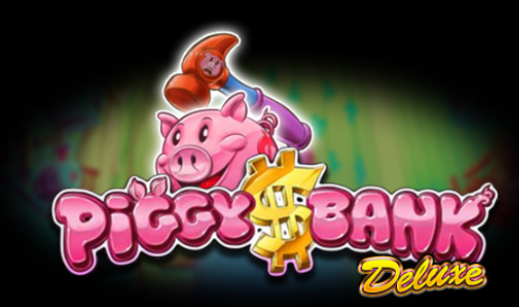 The company has been around for 55 years and is a pillar amongst Online Gambling companies in Malta with almost 1000 employees. They will not try to lie, cheat or steal from you, unlike some less reputable casinos in ‘licensed’ across the pond. Betsson has a good mobile site, but if you like to play on your computer, the Desktop version is quite dated and is really in need of an update. The Casino offering is really where Betsson stands out and the guy in charge of that has done a great job over the last three years. They produce exclusive games with several different Game Studios, such as Netent, Push Gaming, PlaynGo, Leander and Yggdrasil as well as their in-house brand Games Inc, which started launching games last year. 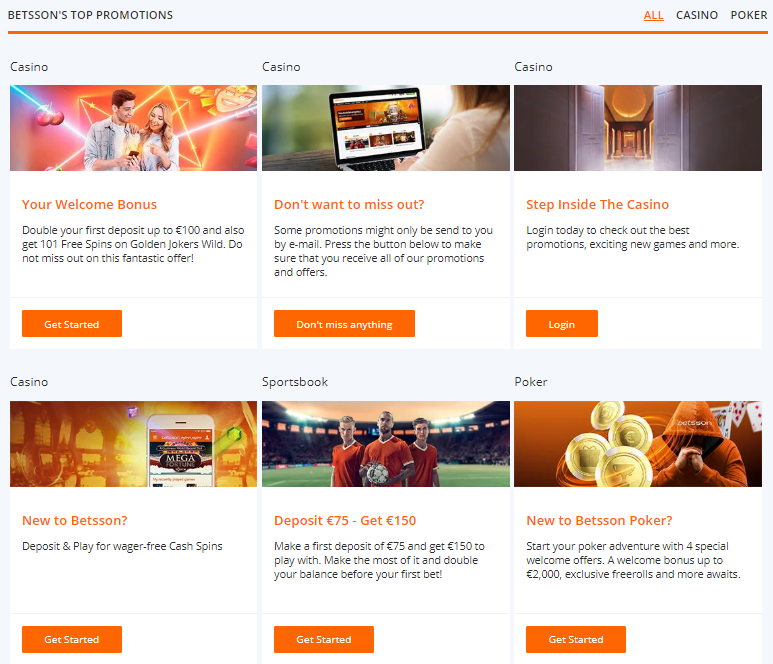 For Slots lovers like us, given the range of exclusive slots and rare providers, Betsson has a lot to offer which you simply cannot find anywhere else. Betsson offers different welcome bonuses for each market, with the highest bonuses going to the Scandic regions. 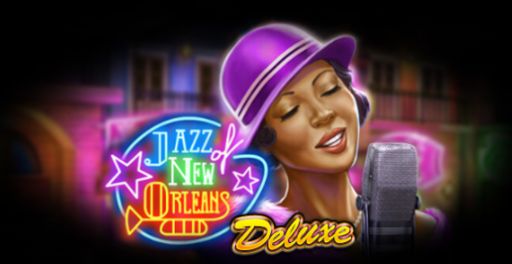 For those of us living outside of the “preferred” markets, there still a quite good but pretty standard 100% up to €100 plus 101 free spins on Golden Jokers Wild. Many banned countries: Albania, Australia, Austria, Azerbaijan, Belarus, Bosnia and Herzegovina, Brazil, Bulgaria, Croatia, Greece, Israel, Japan, Kazakhstan, Macedonia, Moldova, Montenegro, Poland, Romania, Russia, Serbia, Slovenia, Switzerland, Turkey, and Ukraine. 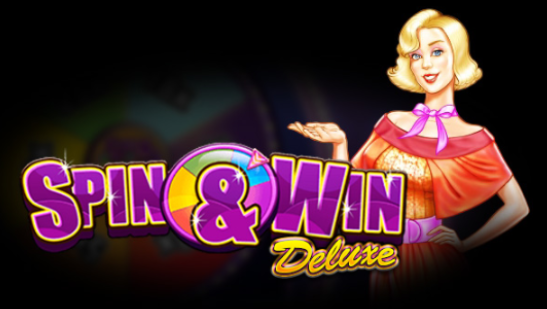 When it comes to the Live Casino, Betsson spares no expense. 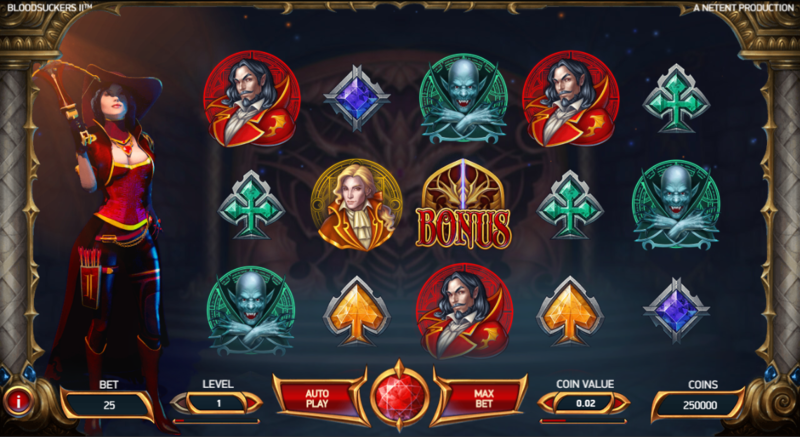 You will find the Live Casino with its own tab and compared to the slots lobby when on Desktop, it seems to have actually received a bit of TLC in the last years. The thumbnails have a lot of extra information which allows you to quickly determine which game you want to launch without needing to look further. Besides the full range of standard games from Evolution Gaming and Netent Live, you can play in Betssons own exclusive environment in collaboration with Evolution gaming. On these VIP tables you can try your luck at higher stakes, or simply sit and watch big VIP gamble at stakes others can only dream of. 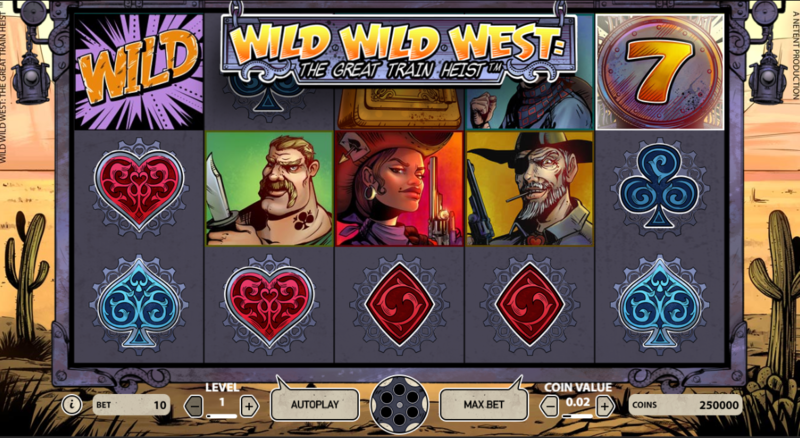 Through Evolution, you can also play Live on Roulette from landbased casinos around the world, with Grand Casino Barcelona, Hippodrome in London and Dragonara Casino in Malta being the first three locations available. 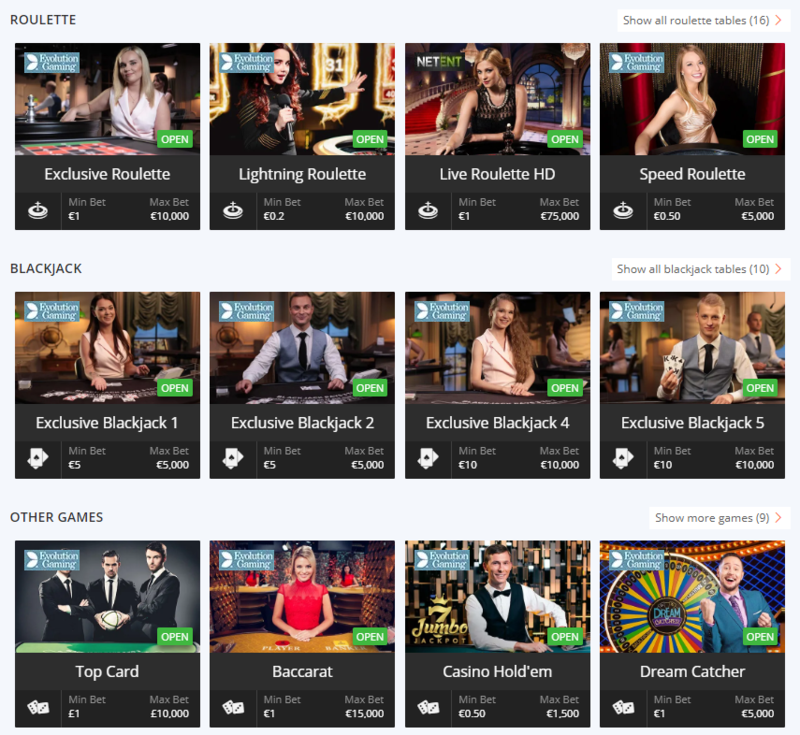 Betsson has also recently released real roulette games via Authentic Gaming, where you can play roulette at Foxwoods Casino resort in the US. 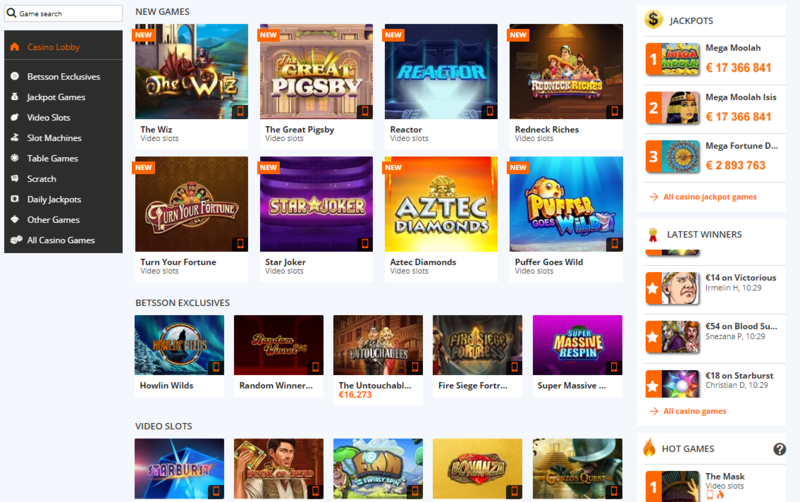 As you can see, at Betsson you have almost every flavour of Live Casino you want, except Asian. For a 55 year old company providing gaming enjoyment to gamblers in so many different ways and jurisdictions, Betsson should really have a better offering when it comes to their promotions. They do a lot of things right, but promotions are not one of them. The playing experience when you are on your mobile is much newer than the desktop site, and it show both in terms of loading speed, but also in terms of ease of navigation and simply finding the games you want to play. We give Betsson 4.5 out of 5 stars. They are a strong and stable company, with a great range of products and payments, licensed in many different jurisdictions. They could have gone for a 5, but their below than average Desktop site and their promotions which leaves the player wanting makes sure that Betsson stays at 4.5. Maybe when someone takes the decision to spend some time upgrading their desktop site we will update the score to a 5, but for now it is a 4.5.